Yes, OK, that was a terrible pun. I'm not proud. Despite the cold and wet, just over 3,300 hardy supporters turned out to see Saracens thrash G.R.A.N. Parma in their Pool 2 match of the European Challenge Cup. Sarrie the Camel was in festive mood, dolled up with tinsel and a Santa hat atop his fez [left]. And the team were having fun too - they ran in 11 tries, the final score being 71-16 to the home side. Great to see Richard Hill back on the park, fit again, and scoring. We missed him! [Kameli Ratuvou shows the Parma defence a clean pair of heels as he heads for an intercept try, Sarries 11th of the game last Sunday.] See more of my photos from this game at the usual place. The other great news from the last week is that Glen Jackson has signed an extenion with Sarries until the end of the 2009/10 season. The way he's scoring points at the minute, that's fabulous news! Richard Hill scored on his first Saracens game back from injury, in last night's EDF Cup match against Wasps. It was apparently very wet, but Saracens won 26-15. And althought neither team could progress out of their group, it was still quite a good game, by all accounts. Thomas Castaignede was at Fly Half and got 16 poinst with the boot. I didn't attend that match, but here's a photo [left] from the equivalent fixture last season, at Adams Park. On that occasion, Wasps ran out winners with 42-8. 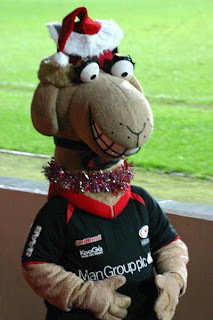 Now Saracens have to keep up their momentum for the next European Cup match, against GRAN Parma, on 10th December. I shall be attending that one, so will post some photos when I can. Meanwhile, the debate over Robbo and his successor still rages. Johnno says he's not keen on coaching right now. Mike Catt suggests Dean Richards would be a great choice. Calls have come for RFU Chief Exec Francis Baron's head, but he's having none of it. And the dirty laundry is beginning to be aired - former England defence coach Phil Larder tells us what he thinks of Andy Robinson's decicion making. Finally, tomorrow sees the last game of the Sprinboks' autumn tour, against a World XV at Welford Road. Saracens provide four international players for the World XV - Cobus Visagie (South Africa), Fabio Ongaro (Italy), Thomas Castaignede (France) and Andy Farrell (Great Britain RL). Their captain is Lawrence Dallaglio. Let's see how Faz performs in such esteemed company!